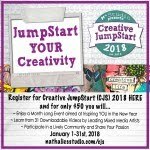 Art is You Mixed Media Retreat starts tomorrow. It's hard to believe that it's here at last! Sal and Ellen asked the instructors to make art to donate to the Generosity Project Silent Auction. This year's beneficiary is Give Kids the World, and the theme is that everyone is a superhero. I love that Art-Is-You gives back -- one of the many reasons I am so proud to be teaching for them. As Gilbert said, this is by far the most efficient way to be rescued! 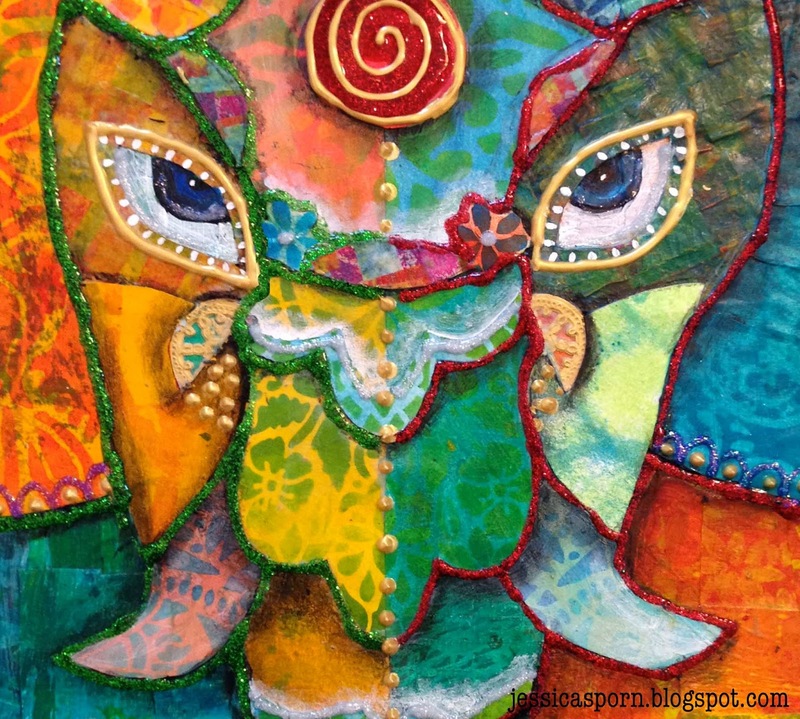 This quote moved me to create a Ganesha, the remover of obstacles. 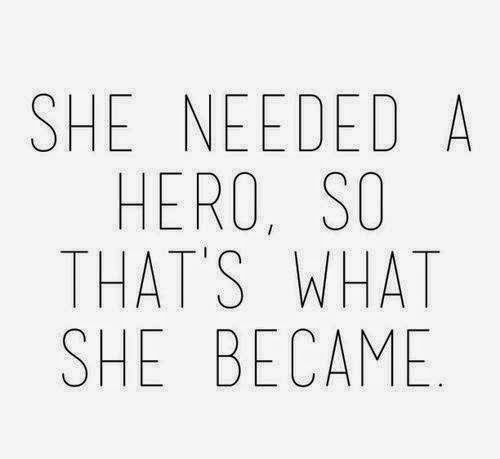 We each already have the power to be our own rescuers - sometimes we just need help removing the obstacles in our paths so that our superhero powers can shine through. 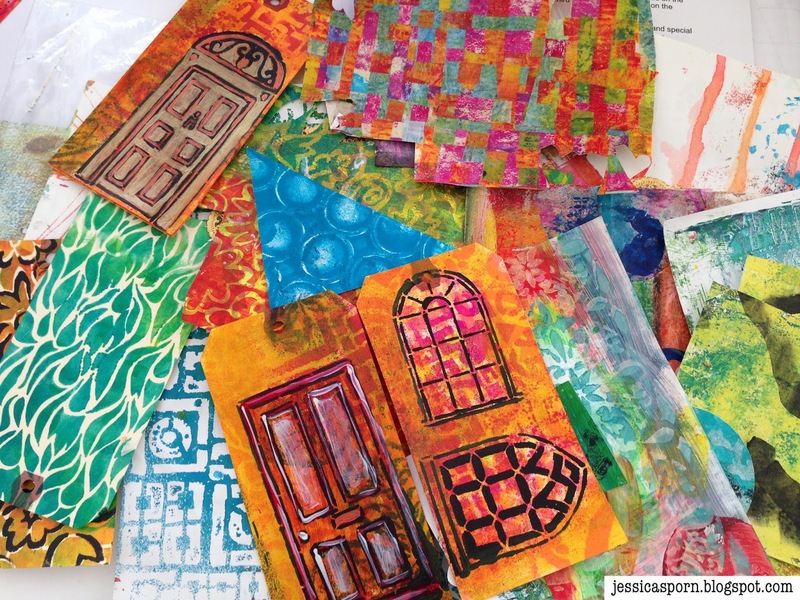 I started by gathering all the scraps of paper and tags from various gelli printing sessions, try-outs of my stencils from Stencil Girl Products (recognize the Doors & Windows, Cascading Feathers, Circles & Squares, and Flowers Positive and Negative? ), and other art adventures. 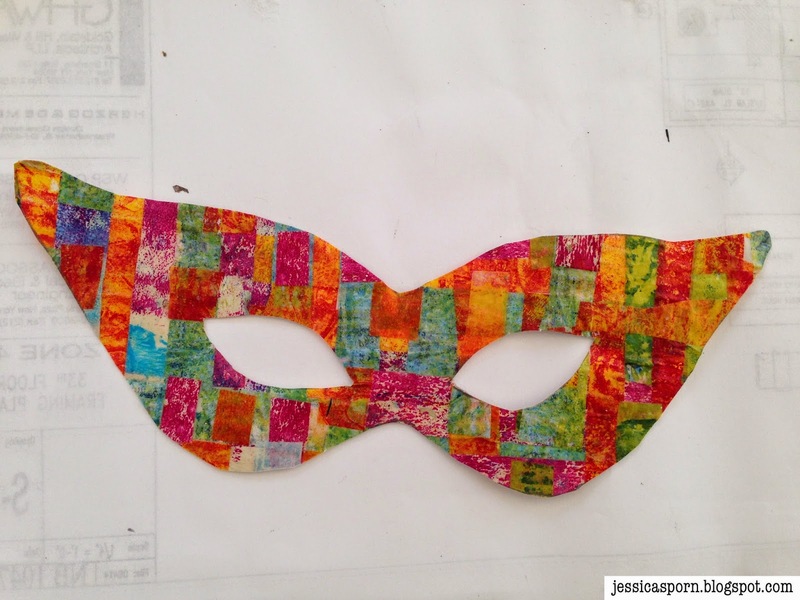 I cut out a mask from a template, using the woven gelli prints I talked about in this gelli play-date post. 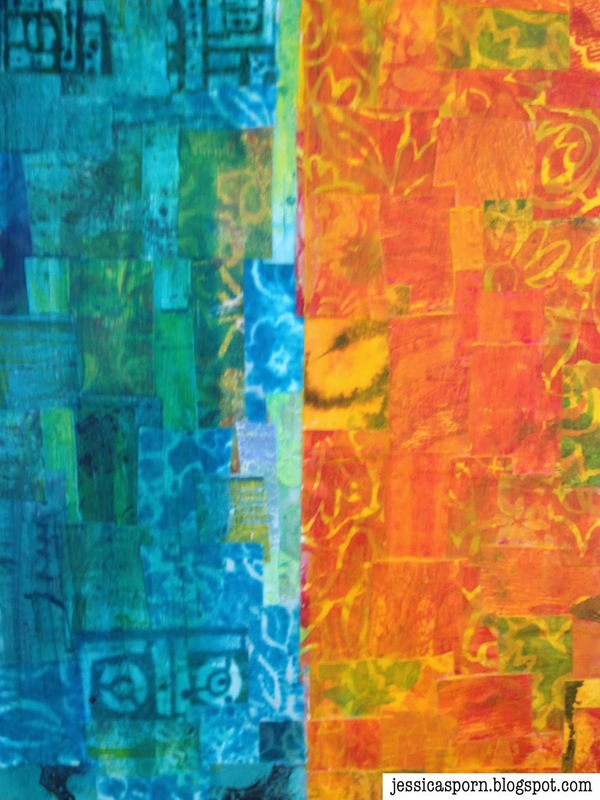 I cut out strips and squares from many of the other prints, and collaged them on a 9 x 12 canvas -- cool colors on the left, and warms on the right. Then I glazed them to pull them all together. 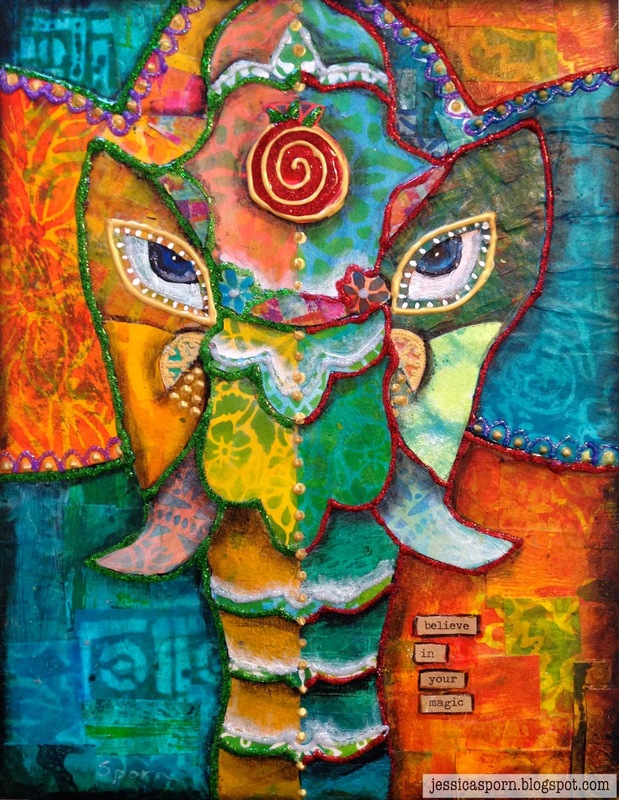 I cut the mask in half for the eyes, and used the other scraps and pieces to collage my Ganesh face. I used my Ganesh stencil as a reference, but let the piece take on a life of its own. Glitter glue and Scribbles 3D fabric paint gave the piece added dimension, and Tim Holtz's chitchat stickers allowed me to create the sentiment I wanted. "Believe in Your Magic." 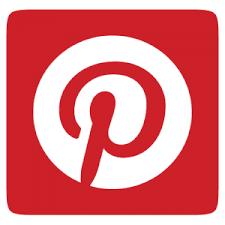 I can't wait to see all the Super-Hero creations at the Silent Auction. I've already seen a preview of one of them. Check out Marjie Kemper's amazing mask here. 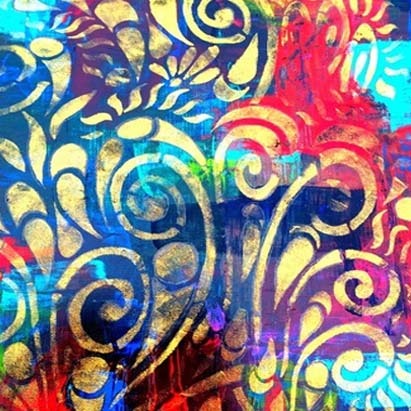 And if you are in the Connecticut area, stop by the Art Trunk at the Sheraton Stamford on Saturday, October 11th. The Silent Auction will be one of the highlights, and many of the instructors and other artists are exhibiting - Marjie included! I can't wait to see it and all the others this week. It's just beautiful. I love the warm/cool color division and the switch/patterns of cool shapes in the warm background and the same on the other side. My 10 yr old loves that you used Glitter Glue ! Namaste. So rich - love all the glorious papers you used.